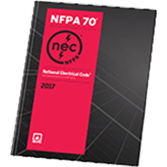 Throughout the United States and around the world, NFPA 70®, National Electrical Code® (NEC®), published by the National Fire Protection Association (NFPA), sets the foundation for electrical safety in residential, commercial, and industrial occupancies. Learn more about adoption efforts, status, and the support of the Electrical Code Coalition, which works to increase focus and emphasis on electrical safety for persons and property through direct and full adoption, application and uniform enforcement of the latest edition of the NEC. U.S. states vary widely in how promptly, or even if, they adopt the latest edition of the National Electrical Code. Not adhering to the latest edition can lead to serious shortfalls in electrical safety for citizens and a failure to protect first responders and workers from preventable dangers. Read the highlights of the full Falling Behind in Electrical Safety report, plus an infographic that explains the making of the 2017 National Electrical Code. Download the summary & infographic. Where is the National Electrical Code® in effect? NEW! CodeFinder™: Insight you need on NFPA codes and standards. As of April 1, 2019, the 2017 NEC is in effect in 28 states, the 2014 NEC is in effect in 15 states, the 2011 NEC is in effect in one state, and the 2008 NEC is in effect in three states. If you have a question on the status of NEC adoption in any state, please contact your NFPA Regional Electrical Code Specialist. 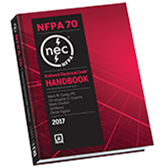 Note: The 2017 edition of the NEC was issued by the NFPA Standards Council on August 4, 2016. The effective date was August 24, 2016, when it officially became available for adoption by federal, state, county, and municipal governmental entities. The 2016 California Electrical Code, California Code of Regulations Title 24, Part 3 is based on the 2014 edition of NFPA 70®, National Electrical Code®. The 2011 New York City Electrical Code is based on the 2008 edition of NFPA 70®, National Electrical Code®. As of April 1, 28 states have completed its 2017 NEC update process. Ten other states are in the process of revising the statute or administrative rule through which the NEC is updated to reference the 2017 edition. Nine states are using the 2014, 2011 or 2008 of the NEC and are not in the process of updating the edition currently in use. The following table shows the edition of the NEC in effect in those states having a statewide regulation that impacts construction, trade licensing, or both. Follow the link to the board or agency responsible for updating the NEC.